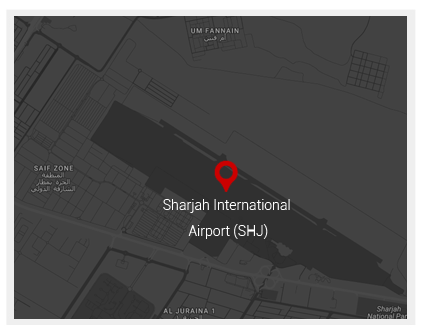 Sharjah International Airport is one most important transport hubs in the Middle East. The headquarters of Air Arabia, the UAE's national carrier, Sharjah connects over 11 million passengers to over 100 destinations worldwide. Sprawling over 3,800 acres, the airport is located roughly 13km from the Emirate of Sharjah and 15km from Dubai and is within easy reach of many of Sharjah's most popular attractions. From quaint fishing villages to breath-taking high-rises, Sharjah, Dubai and the surrounding region is a joy to explore by renting a car, not least because of the UAE's modern highways. Because there is a Self Drive Rent a Car Branch located in Sharjah and we would delivery the car reserved at the Arrival lounge just befor you arrive so you can hit the road as soon as you arrive at the airport its perfect and seamless - Start your UAE adventure NOW. Opened in the late 1970s, Sharjah Airport is today one of the UAEs main transport hubs. The airport consists of a single runway and is served by international and regional carriers, including low-cost airline Air Arabia, Singapore Airlines and Qatar Airways. Sharjah Airport is also a major airfreight hub, the third largest in the Middle East in terms of cargo tonnage. Plans are underway to increase the airport's capacity to 25 million passengers by the year 2025. Sharjah International Airport offers all the services and amenities you would expect from a major transport hub, including Duty Free retail space, lounges, children's play areas, and food court. There are several hotels located close to the airport, including Centro Sharjah Hotel. Self Drive Offer's you the a wide range of services on your Airport Car Rentals. Express pick-up of your rental car – Car Delivered at the Arrival on Airport. Easy 3-step online booking - Search, Select, Reserve. Rent A Car from our Fleet of Small, Sedans, MUV, MPV, Compact SUV, Full Size SUV. Rent for Day, week, monthly or lease a car for short and long term rental. Renting a car at Sharjah International Airport is easy, Just reserve your car online via selfdrive.ae website or mobile and head straight out of the arrival gates you will find our team manager waiting for your arrival just show your reservation details and documents and you are free to drive straight from the Sharjah Airport to your destination. You must be at least 21 to rent a car in the UAE, and 25 in some cases. You must also have been in possession of a full and valid licence for at least one year. Customers with the following national driver's licence can drive in the United Arab Emirates without an International Driving Permit (IDP): Australia, Austria, Belgium, Canada, Denmark, Finland, France, Germany, Great Britain, Ireland, Italy, Netherlands, New Zealand, Norway, Poland, Romania, South Africa, Spain, Sweden, Switzerland and United States of America. Visitors to the UAE are only allowed to drive rented vehicles with the appropriate insurance and a full license. Visitors can drive the rented car from Sharjah to Abu Dhabi, Dubai, Ajman, Al Ain, Fujairah, Ras al Kahimah. With selfdrive offices across UAE you are sure to have us on your back just incase you ever need us. In the United Arab Emirates cars are a big deal, which you can tell as soon as you hit the ultra-modern highways. Head to the Sharjah Classic Cars Museum, located just a 3-minute drive from the airport, to get a fascinating glimpse into the history of the automotive industry with the oldest car on show dating back to 1917. If you and your family love cars, it is definitely worth taking the short drive from the airport to visit this fascinating museum. While its neighbour Dubai might loom large (quite literally) with its sky-high luxury hotels, the Emirate of Sharjah definitely rewards a visit. In 1998, UNESCO awarded it the title of Cultural Capital of the Islamic World, where you'll find some of the world's most stunning cultural and historic landmarks, including a number of traditional souks and The Sharjah Art Museum.